Summer time with family is my favorite time of the year. I recently had the opportunity to spend time in The US with family, and when my family gets together, we love to cook, then share our meal together. Both my kids grew up loving to help out in the kitchen, and now my grandchildren are doing the same. I find when working with more than one of the kids, it is best to give them separate tasks to complete as things do not always go smoothly when they are sharing kitchen chores. My eight-year-old grandson is just starting to use a chef’s knife (with supervision), and though he needs some practice, he is very careful and loves to chop anything you give him. My thirteen-year-old granddaughter took a teen cooking class this summer, and so she thinks she needs to show her younger sibling how to do everything. To keep the peace, I try and find simple recipes for each child to complete on their own and this delicious salsa was one of them. 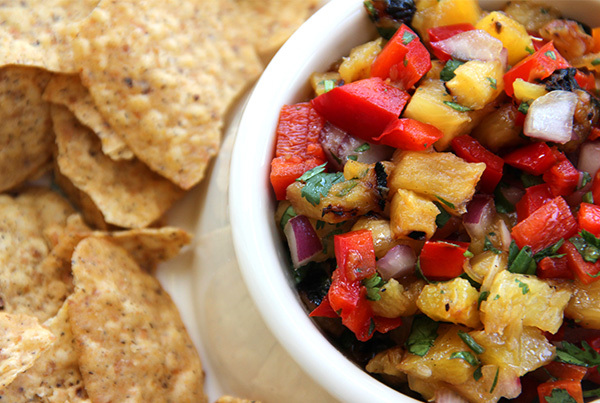 Grilling the pineapple adds a smokey flavor to the salsa that and brings out the sweetness of the pineapple. My daughter grilled the pineapple, then the rest of us chopped the remaining ingredients. I divided the recipe in half, and added minced jalapeño to one-half, and kept the other mild flavored for the kids. 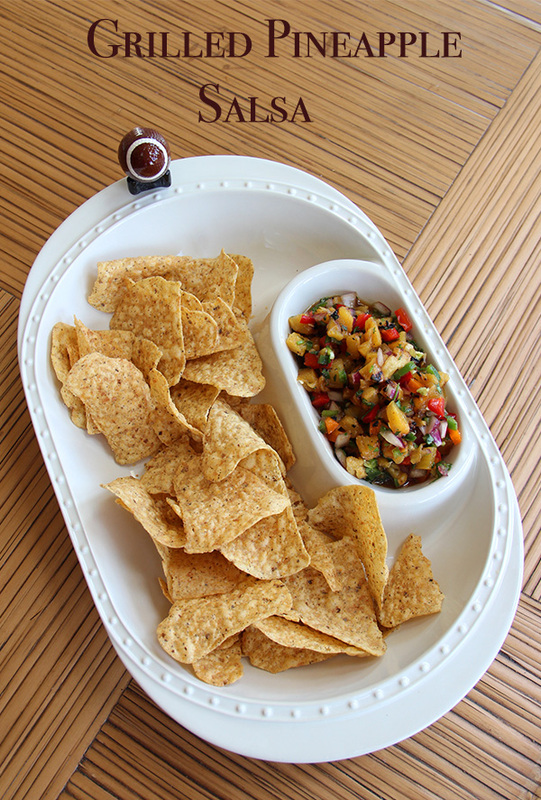 We served this salsa with whole grain tortilla chips, and it was gobbled up in no time. I made the decision to grill just the pineapple because I wanted the salsa to have texture by keeping the other ingredients raw, but if you wanted to, you could also grill the onions, sweet pepper, and even the jalapeño! 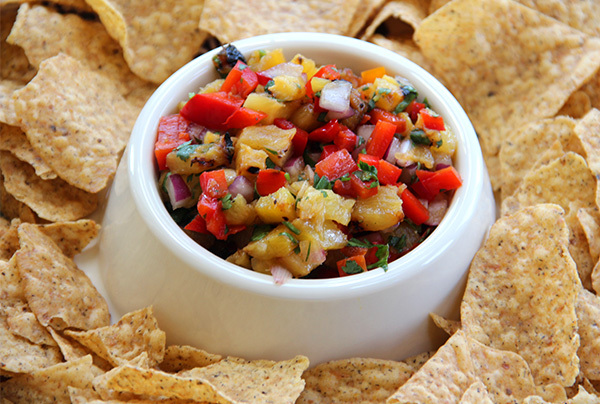 This salsa is a great recipe to prepare during the heat of the summer when entertaining outdoors since you use the grill in place of the oven, and it also packs well for picnics or potlucks dinner with friends. Pineapple is high in vitamin C, manganese, fiber and contains an enzyme called bromelain that helps digest food by breaking down protein. Bromelain is also known to have anti-inflammatory properties. This is a fat free, healthy snack or appetizer. Grill the pineapple slices on both sides until lightly charred. Dice the pineapple, discarding the core, and place in a large bowl. Add the other ingredients to the bowl with the pineapple and toss well to mix. Place the salsa into a serving bowl and refrigerate until needed. Serve alongside whole grain tortilla chips.